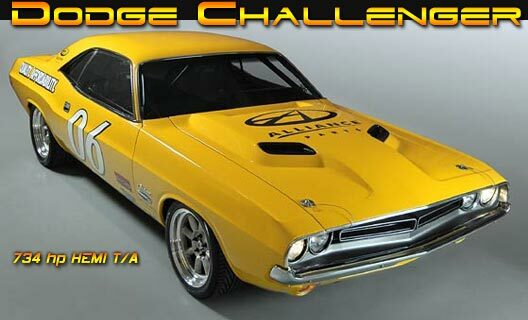 This is a one of a kind incredible muscle car featured in the October 2007 edition of Hot Rod Magazine. It is the centerfold article titled CHALLANGE THIS! And let me tell you this car means it... no joke!! I have all receipts from the build that exceed $252,000.00; that's right, 252K. ENGINE: Keith Black block with an oiling system modified for a wet/dry-sump setup for consistent high pressure under all conditions; the crank is a rged crank fully balanced with a 4.150-inch stroke with 4.505-inch bores; it displaces 529ci with a bore/stroke ratio of 1.06:1; the pistons are custom JE 10.5:1 on Oliver rods. Mopar/Indy aluminum heads received about 40 hrs of porting and machining, then were mated with an Indy medium-rise intake with a Holley Dominator 1050 cfm carb perched on top; the cam is a custom ground Comp piece set up for a 4000-rpm torque peak and a 6000-plus rpm peak; Jesel components keep the valve train stable. 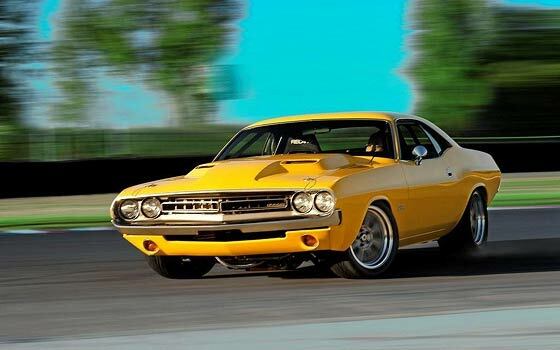 POWER: The big Hemi makes 734 hp at 6000 rpm on pump gas, that's right, pump gas!! 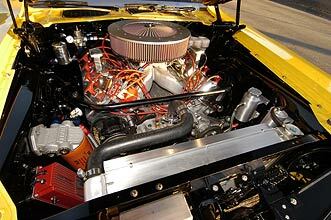 TRANSMISSION: A Tremec TKO five-speed with a Centerforce clutch sends the power rearward. REAREND: Dutchman Motorsports assembled the Strange Engineering Dana 60 with 3.54:1 gears 35-spline axles, and a Tru-Trac limited-slip differential. The driveshaft was dynamically balanced to 8,500 rpm. SUSPENSION: The front end is a modified Magnum Force tubular K-member with tubular roll arms and a TRW rack-and-pinion. The rear suspension is an HRC designed triangulated four-link with Aldan Eagle coilover shocks on all 4 corners. Custom IPD sway bars handle the twist at both ends. BRAKES: Brembo four-piston monoblock racing NASCAR calipers equiped with Pagid semimetallic pads put the squeeze on 14.25-inch rotors up front; with 13-inch rotors on the rear. Twin Wilwood racing master cylinders provide the pressure. WHEELS: The wheels Vintage Wheel Works V48, 17x9.5-inch front, 17x11-inch rear, but reworked by HRC for ideal offset and fitment to the giant calipers. TIRES: Michelin Pilot Sport Z-rated tires are 265/40ZR17 front and 335/35ZR17 rear. BODY: There are subtle modifications to the body, but the muscular Challenger lines remain. 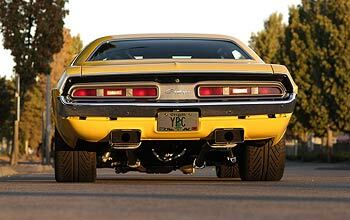 The body at the rear quarters was widened 2 inches per side and fitted with 2-inch wider wheeltubs. The front wheelwells were also widend 2 inches per side. The floor plan was altered from the firewall to the rear fascia to accommodate the subframe connectors, suspension, rollcage, and fuel tank. The rear quarters and tulip panel were replaced with new Year One pieces. The hood carries the R/T lines, but it has been raised 1.75 inches to clear the induction. INTERIOR: The stock dash was modified to fit around the rollcage and fitted with a custom panel with VDO Series 1 gauges. The stock dashpad and interior panels were restored and the custom carpet and the headliner were all modified to clear the rollcage. Recaro seats with 6 point belts hold you firmly in place. The car looks more show car than race care. It won it's class at the Portland Roadster Show in 2007 and also won Best of Show at Eugene Roadster Show in 2008. The car has only gone to these two events, but this car will win any show it goes to with no problem...Desinged to Go and Built to Show! This Car is Bad, Mean and Everything you ever wanted in a Race Car or Show Car and MORE!! !